What if you'd like to connect your Windows 8.1 laptop to four routers, each at factory defaults, doing the initial configuration, one router at a time. But each router is also a DHCP server, feeding your laptop with a 192.168.1.x address. If you put an ethernet switch or hub between your laptop and one LAN port on each of those four routers, you'll have a DHCP free-for-all, where you'll randomly get an IP address from the first router that happens to respond. There is a better way to connect to multiple networks simultaneously, while preserving each network's isolation from the other networks. One way around this is setting up one router at a time, cabling to just one router, setting the IP, then re-cabling to the next router, and so on. 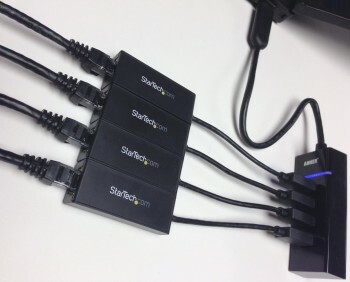 Or you could just grab 4 of these USB 3.0 to gigabit adapters I already had in numerous roles in my lab, and stick them all on one passive USB 3.0 4 port hub. Tada, solved! Super easy to label each ethernet port, then activate just one network at a time for demonstration purposes, which is evident in my video "Triple Router Deep Dive Hour - internet outage comparisons, after altering AC1900 router settings" video embedded below. Other use cases? 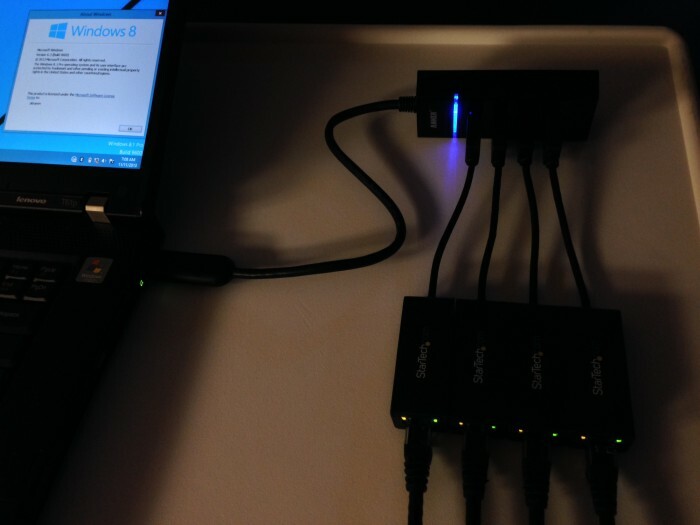 Of course, you can use the self powered USB 3.0 hub in your travel kit, with robust, sleek design and stable Windows 8.1 native driver support. And the gigabit adapters are very handy for dual-homing any device, where simultaneous connections to multiple separate networks is desired. if you attach the gigabit adapters or the 4 port hub to an older PC’s USB 2.0 port, the network speed isn’t adversely affected, as long as you’re only stressing one network adapter at a time. This table helps clarify why. using one Gigabit to USB 3.0 adapter, this could be a rather unique use of dedicated, isolated networking for a virtual machine, removing the the need to take up a PCI slot, and removing the need for pass through. Good old simple USB mapping works fine under ESXi, for example. getting even more creative, you could try to map the hub to a VVm, haven’t tested that yet. But I did get your imagination going, no?